What Are the Types and Causes of Headache? Headache is one of the most common complaints for which patients seek medical attention. The underlying cause could be neurological, ENT-related, systemic diseases or idiopathic (cause not known). Can headache occur as a side effect of BP medicine? Is headache a side-effect of Nevanac ophthalmic suspension? Patient above the age of 55. Sometimes, the site of the pain can give us a clue to the diagnosis, like temporal region in temporal arteritis, facial pain in sinusitis, etc. The duration of the headache becomes important like in instant onset (ruptured aneurysm), cluster headache (three to five-minute peak), and migraine (peak pain over minutes to hours). Complete neurological and ENT examination help suspect some of the common causes of headache. In the examination, if abnormal findings are encountered, then imaging investigations are undertaken (CT/ MRI). Lumbar puncture becomes important if meningitis or encephalitis is suspected. A psychological state assessment of the patient might be needed if there is suspicion of depression. Migraine - Typically one-sided, increased by movement, lasts for hours to days, associated with nausea or vomiting, photophobia, phonophobia, and relieved by sleep. A family history is usually present. Most patients do not complain of auras (visual zig zags). Various trigger factors like alcohol intake, lack of sleep, loud sounds, glare, and travel are implicated in the precipitation of a migraine. It is important to identify these, as avoidance constitutes an important step in the management of migraine. Tension-type - Bilateral location, lasts hours to days, a tight band-like sensation around the head, and often precipitated by stress. Relaxation therapy can be helpful to prevent attacks. Cluster headache- Attacks occur in clusters. Unilateral and associated with pain behind eyes, running nose, and watering from eyes. It is a rare form of a headache, and recurrence is characteristic. Alcohol and smoking may provoke an attack. 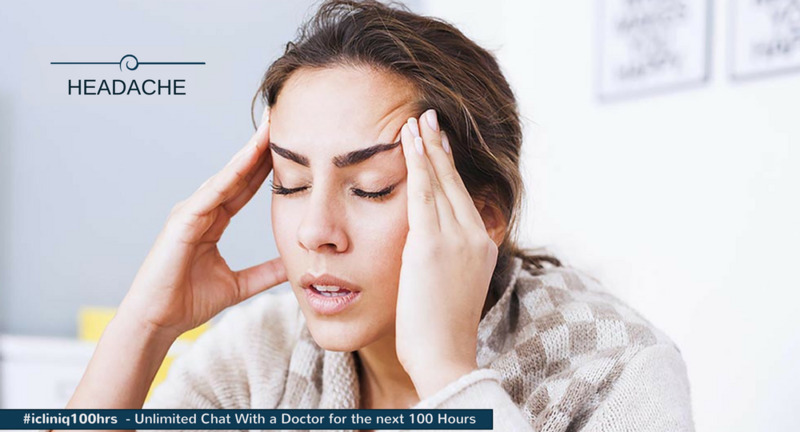 Do you have a question on Headache or Migraine? Why am I feeling hand cramps and leg twitches after stopping Seroquel?